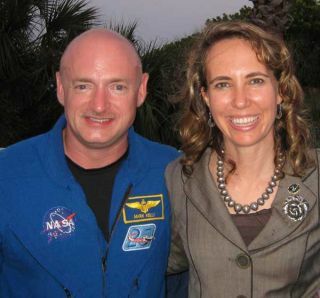 Wounded Arizona Congresswoman Gabrielle Giffords will be at the launch of the space shuttle Endeavour in support of her astronaut husband, mere months after being shot in the head, according to news reports. "I met with her doctors and neurosurgeon, and they've given us permission to take her down to the launch," Kelly told Couric. "We're excited about that." CBS released a clip from the interview, which will air in its entirety tonight (April 25) on the CBS Evening News. Giffords was shot on Jan. 8 after a gunman opened fire at a community event with constituents at a supermarket in Tucson. Six people were killed and 13 were injured in the attack, including Giffords. In February, Giffords was transferred from a hospital in Arizona to a rehabilitation facility in Houston for a lengthy recovery program. The move allowed Kelly, who lives in Houston and works at NASA's Johnson Space Center, to continue training for his shuttle mission while also remaining close to his wife as she recovered. In the months following the attack, Kelly spoke about Giffords' desire to attend the launch, but said that her medical condition, and the progress of her recovery, would ultimately dictate the final decision. When Couric asked about Giffords' reaction to the good news, Kelly said, "I think she said, 'awesome,' and pumped her fist one more time." Endeavour is slated to launch from the Kennedy Space Center in Cape Canaveral, Fla., at 3:47 p.m. EDT (1947 GMT) on Friday. Endeavour's STS-134 mission will be the last spaceflight for NASA's youngest orbiter before it is retired from service. For the upcoming mission, Kelly will command a six-astronaut crew on a 14-day mission to deliver spare parts, supplies and a $2 billion astrophysics experiment to the space station. Four spacewalks are also planned. President Barack Obama recently announced that he and his family will also be in attendance for Endeavour's final launch.